Knot Yo Grandma: DIY Crocheted Reindeer Dog Headdress! 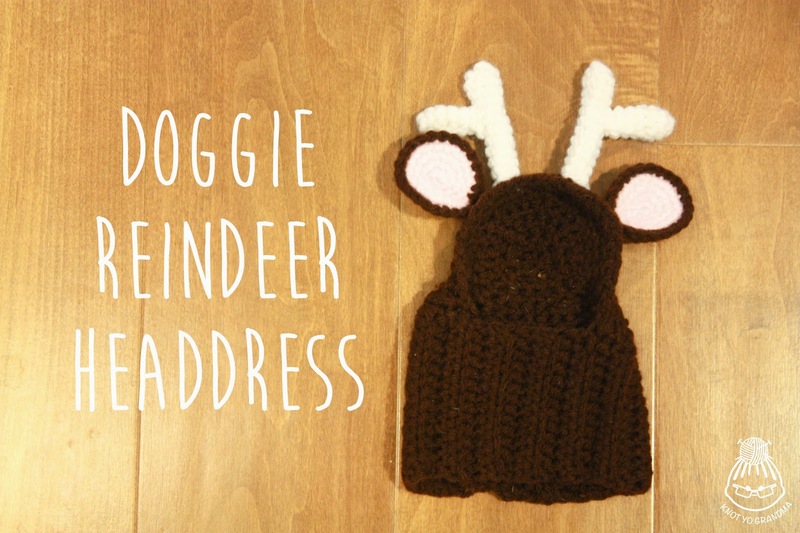 DIY Crocheted Reindeer Dog Headdress! I have seen different versions of these floating around on the internet for years, and I have always wanted to make one for Gareas. Italian Greyhounds ARE reindeer. Unfortunately, that same weird little greyhound body that perfectly mimics a reindeer shape also comes with a tiny little greyhound pinhead. No traditional pattern has or will ever fit him. I despairingly realized that if I were going to make this reindeer business a reality, I'd have to come up with a pattern myself. I didn't bother writing down the stitch counts for the neck and hood as it would be rather useless to anyone who isn't crocheting for a greyhound. I stitched along and just custom fit it to his body as he napped next to me on the couch, tongue lolling out of his head. The neck was crocheted in rows of half double crochet stitches in the back loops only, which gives it that ribbed look. I stitched in rows and kept going until it fit around his pencil neck- then matched up the ends and stitched them together using a whip stitch (as opposed to crocheting in the round). When completed, the neck looks just like a cylinder. The hood part that covers the top of his head was also custom fit- I attached a new piece of yarn into the top of the cylinder at the side of his face (while he was wearing it) and chained until I could attach the chain to the other side with enough room for his face to poke out. Once the chain is attached to the cylinder at both ends, you have a sort-of circle if you look at all the chain stitches and the back half of the cylinder as one piece. Starting where I attached the second half of the chain, I single crocheted around the circle in a spiral, gradually decreasing with each row (making sure to decrease evenly on each side) until I was able to close it. Notes: Antlers are crocheted as two separate pieces and then sewn together. Each row is not joined- continue crocheting in a spiral and use a stitch marker to note the end of each row. ...and keep going until your antlers reach a height you like. I did 11 rows of 6 SCs. Once you complete your last row, slip stitch to close and leave a long tail for sewing. ...keep going until until this piece is a little less than half the size of your first antler piece. I did 5 rows. Once you complete your last row, slip stitch to close and leave a long tail for sewing. Sew the short piece to the side of the long piece using the yarn tail wherever you think it looks best. I attached mine at rows 7 and 8 of the long piece. Repeat above instructions for pink, but do not fasten off. Once both halves are completed, match the pink and brown pieces together with right sides facing out. 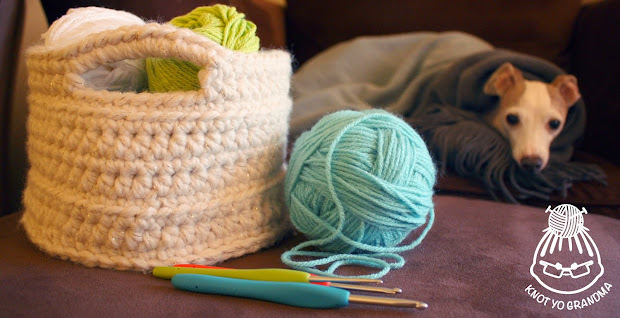 Hide any yarn tails between the two pieces. Once the two halves are matched, SC through BOTH layers in each st around with the brown yarn. Finish off and leave a long tail. Pinch the bottom of the ear together and sew a few stitches using the tail to keep the bottom pinched. This is the same method used to create the ears from my Amigurumi Hedgehog Pincushion- there is a picture in that post here that helps to illustrate how to put the ear pieces together. Now sew the ears and antlers using those handy long tails you left to whatever base you made. You've got yourself a reindeer instead of a dog! for those of us that aren't as talented as you can you please share your pattern for the hood? bit pointless without the whole pattern? Did you guys read the whole article? My niece requested a "reindeer hat" for her dog. I had her give me neck and head measurements and took it from there following your guidelines. works up pretty quick. Thanks for sharing.. I wanted to make one of these for an Italian Greyhound... do you have the hood pattern at all by any chance? It would be for a gift if you get this in time. Seems easy enough going by your hood instructions, I will have to sit next to my dog too to make it as Shepherd's tend to be shorter and more round... I have to do this, you know... just to achieve that classic wide eyed alarmed lol. Thanks again. Did anyone ever get the pattern for the hood??? Then you need to find out as much about those breeds as possible before making your choice. You can find more details on FAQ on the site AnimalHeadGear.com :: The Best Animal Hats Online. ©KnotYoGrandma. Simple theme. Powered by Blogger.